Many players asked for rally guide. So I wanna share some tips about rally attack. 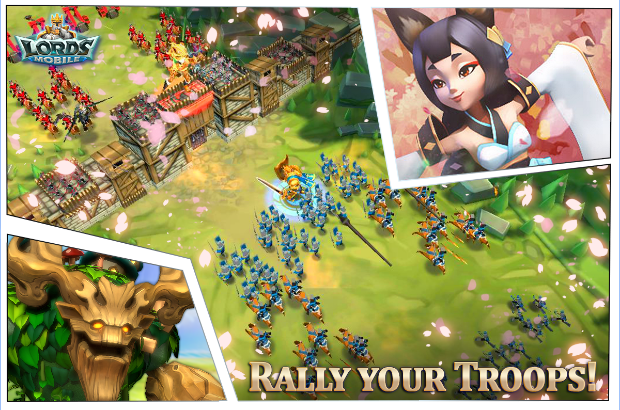 If your prey use anti-scout, you had better start a rally with a single troop type or two troop types, so that you can maximize troops' ATK and lower the chance of being captured. Always remember to take tanks with you, so they can absorb waves of damage. For example: if you send pure ranged for the rally, you should use Inf Phalanx and also send 1 T1 Cav, 1 T2 Cav, 1 T3 Cav, 1 T1 Inf, 1 T2 Inf, 1 T3 Inf. If you still worry your leader will be captured, you can also send a few Siege. 1)You can attack his resources tiles to get the battle report and find out whether he is online or not. 2)If you get his TurfScout Report and know how much wounded in the infirmaries. 3)Use Infantry Phalanx and send 180k T2 siege + 70k T1 ranged + 4 T1 INF + 4 T1 CAV + 4 T1 siege. Also, send 1 Ranged Hero. Note: only T1 troops will die in the test.